The exhibition will be officially opened by Deputy Mayor Graham McClymont. Exhibition continues until 27th January 2019. 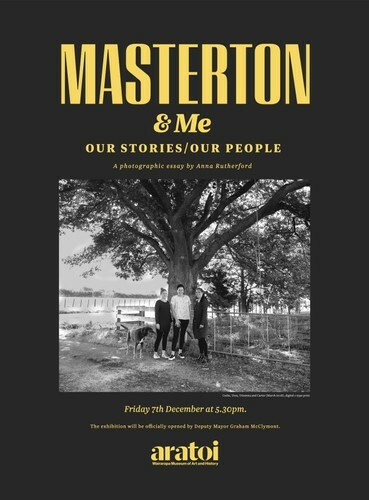 The photographic essay 'Masterton and Me: Our Stories - Our People' celebrates the diversity of the people of Masterton. Anna Rutherford captures Mastertonians from all walks of life from a local farmer and a single mother of five to a retired mechanic and a dairy owner. Photographer Anna Rutherford has studied at the New Zealand Film and Television School in Christchurch, Design School of Victoria University of Wellington, and at Unitec Institute of Technology in Auckland (Bachelor of Design). Anna Rutherford grew up in Masterton, and has lived and worked in UK, USA and NZ as a photographer, ski instructor, graphic designer, production manager, and nanny. It was in London that her love of photographing children developed: one family was wondrously supportive of Rutherford’s photographic work and commissioned her to document their children’s growth, alongside her work as their nanny. Anna created four books for the family, one for each year of her service. Returning home to the Wairarapa in 2016, Anna Rutherford set up her photography practice, again focusing on children and family, and using the subjects’ own environments and natural light. She soon began the ‘Masterton and Me’ project, wanting to hear from people what made the community special for them, and showing the people in a space they loved. The photographic essay has been on continuous display since October 2017 alongside the exterior walls of WBS in Masterton. Anna, her husband Don, and their children, Albion, Charlie, Rupert and Daphne, live in Masterton on land that her artist father grew up on, and where Anna herself had spent much of her childhood.